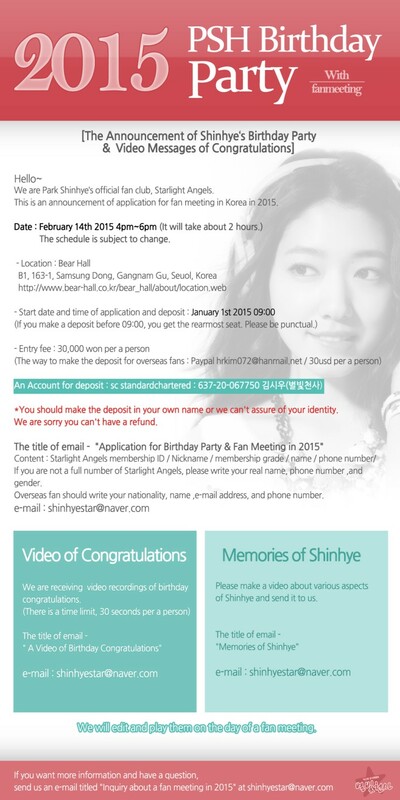 The new year has just begun, but Shin Hye already has her first gift to her fans all planned. Her birthday party does not only come in the form of a fan meeting, it also falls on Valentine's Day. This surely is a double treat to all her fans. The birthday party/fan meeting will be held on February 14 (Saturday) 4:00 - 6:00 PM (KST) at the Bear Hall in Gangnam-gu, Samseung-dong, Seoul. Tickets are priced at 30,000 won. Keep tabs for more details in the following weeks. How can I deliver a personal gift to her?